Sliabh an Iarainn or ‘Mountain of Iron’ derives its name from the iron deposits to be found in the rocks. This was also reputed to be the place the Tuatha de Dannan landed in ancient Irish legend. 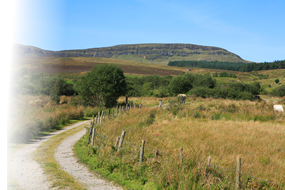 Discover and enjoy Sliabh an Iarainn, the beautiful rugged mountain in South County Leitrim, which ascends 585m(1927ft) from the eastern shore of Lough Allen, the first of the great Shannon lakes. Sliabh an Iarainn Way trails cater for the individual, or for groups of people who want to escape from the frantic pace and stresses of their everyday lives, away from the crowds and into the unspoilt solitude and tranquillity that is unique to this area. Terrain includes country roads, forest walks and open mountain. 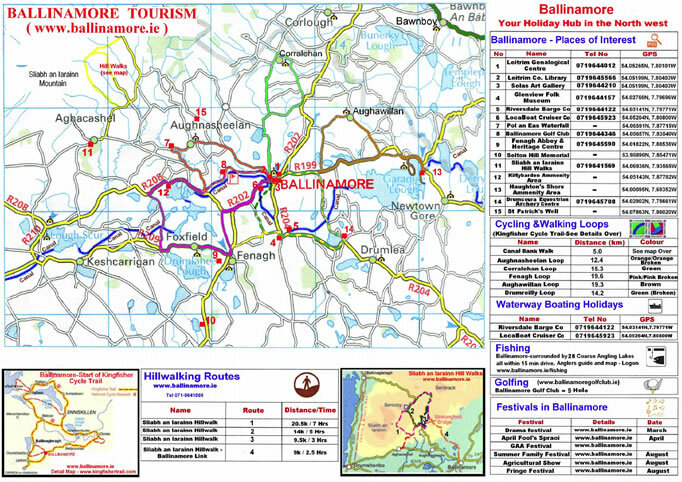 A series of Way Marked Walks on the slopes of Sliabh an Iarainn and Bencroy mountains – just 5 miles from Ballinamore town and Drumshanbo. Choose from a full days walk of 20km with shorter half day walks. Each walk is documented with colour and brief notes on route finding, local and natural history. 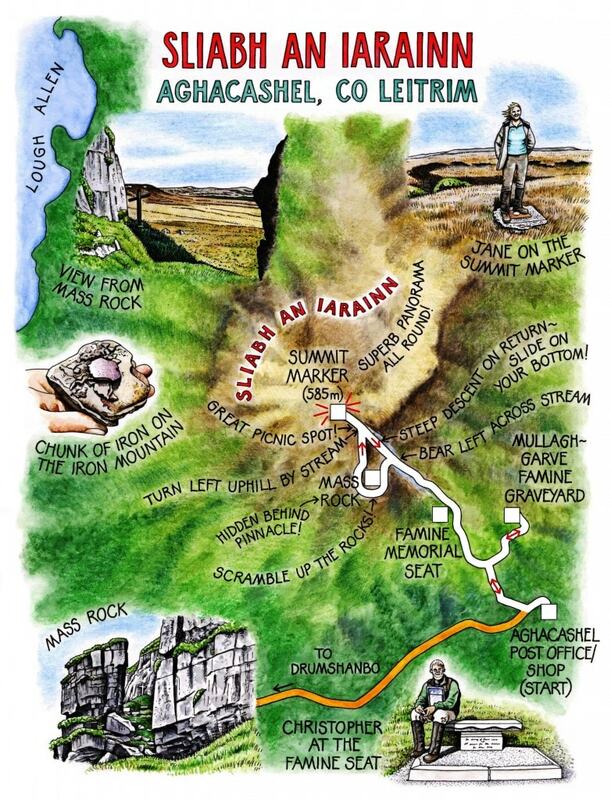 Features Sliabh an Iarainn or “Mountain of Iron” derives its name from the iron deposits to be found in the rocks. An ancient Irish Legend relates that the Tuatha de Dannan landed in Ireland in this very place. The Sliabh an Iarainn Looped Walks Guide is available at Ballinamore Tourism Centre High Street. 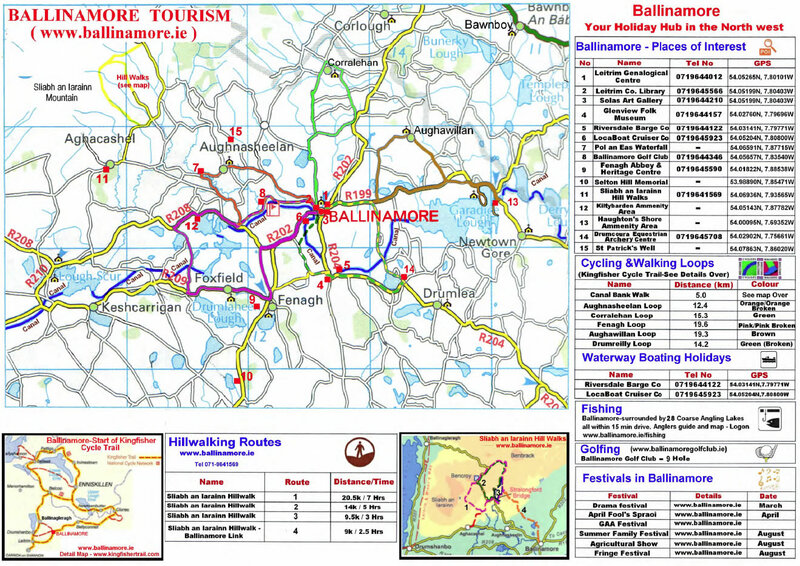 The Ballinamore Tourism Map is available at Ballinamore Tourism Centre High Street.